The Golden Circle is the name given to a 190 mile (300 kilometer) circular route from Reykjavik and back which encompasses many of Iceland’s most famous landmarks. 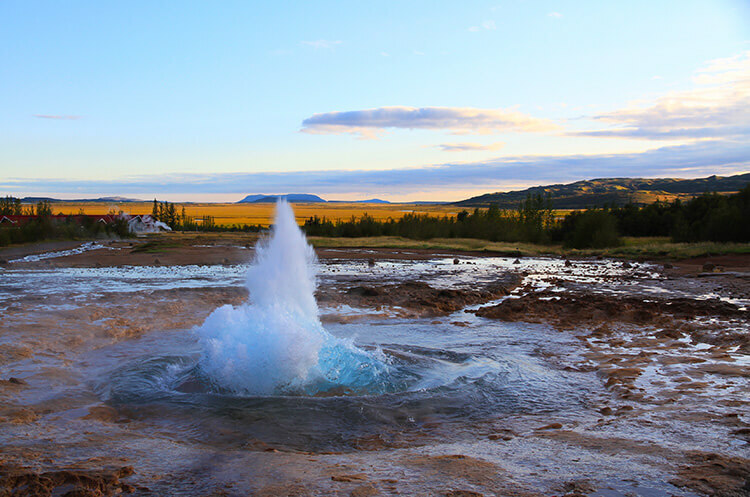 Most visitors to Iceland’s capital take a Golden Circle Tour, which will cover the three most popular stops along the route: Þingvellir National Park, Gulfoss, and Haukadalur where the geysers are. Never much ones for guided tours, we did our own self-drive Golden Circle Tour with our rental. 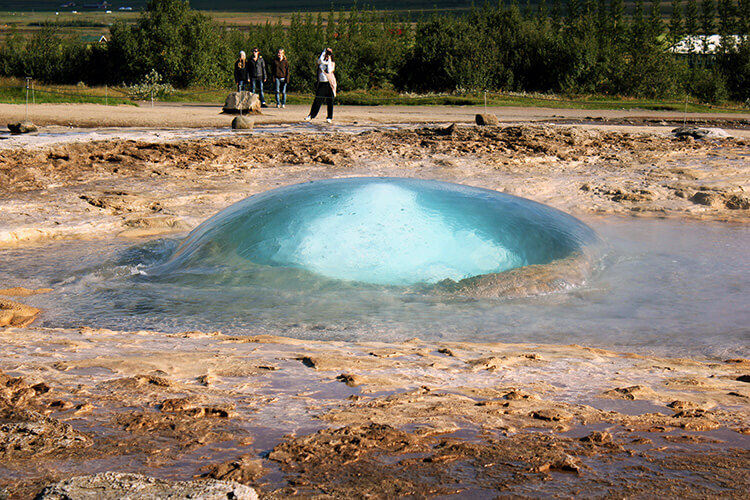 All the sights on the Golden Circle route, which the exception of Kerið crater, are free to visit. 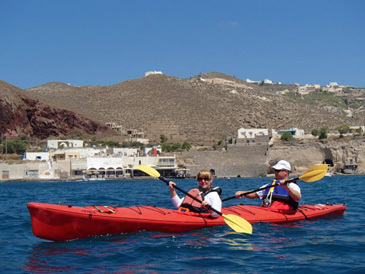 A self-drive tour gives you the freedom to explore on your own time and even avoid the crowds of bus tours. As these are the most traversed tourist sites in Iceland, the roads are well maintained and all of the stops are just off the major roadways. It’s easy to visit anytime of the year and instead of paying for an unnecessary bus tour, splurge on the experience of snorkeling between the North American and Europeans continents at Silfra. We began at Þingvellir National Park, the seat of the Alþing. At Þingvellir – literally “Parliament Plains” – the Alþing general assembly was established around 930 and continued to convene there until 1798. 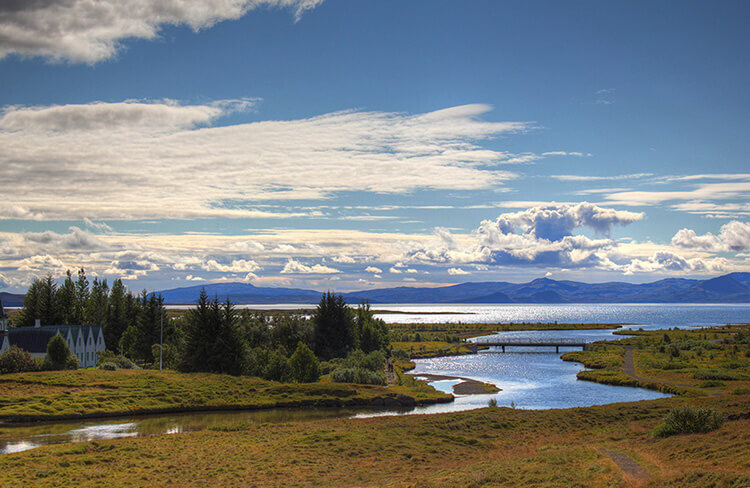 Þingvellir was conveniently located for access from all regions of the country by old overland routes. During the Alþing session each summer, the members stayed in “booths” or temporary shelters. Overgrown foundations of such shelters from the later centuries are visible on the parliament site. All major events in the history of Iceland have taken place at Þingvellir. 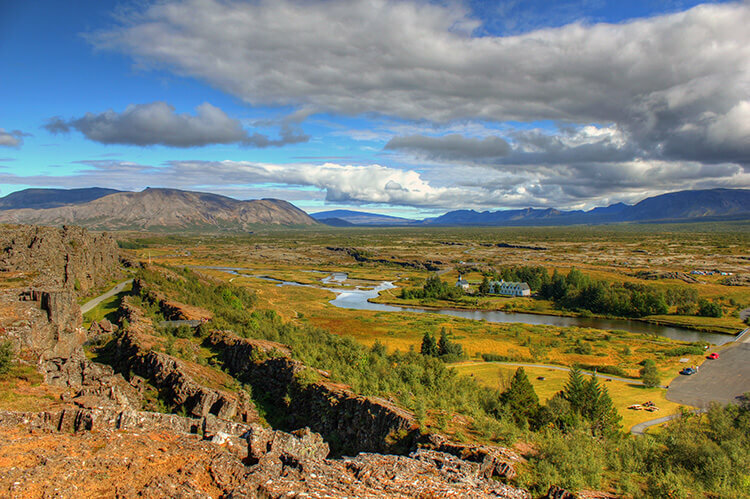 Þingvellir is the only place on earth which tectonic plates can be seen above ground. The large abyss-like cracks in the earth that appear to literally split this area in half are actually the results of the separation of the the Eurasia and North American tectonic plates. There is a tradition here in Þingvellir to throw money into Peningagjá (peningar = money in Icelandic) and make a wish. The water is crystal clear making it a beautiful sight watching your coin sink to the bottom. 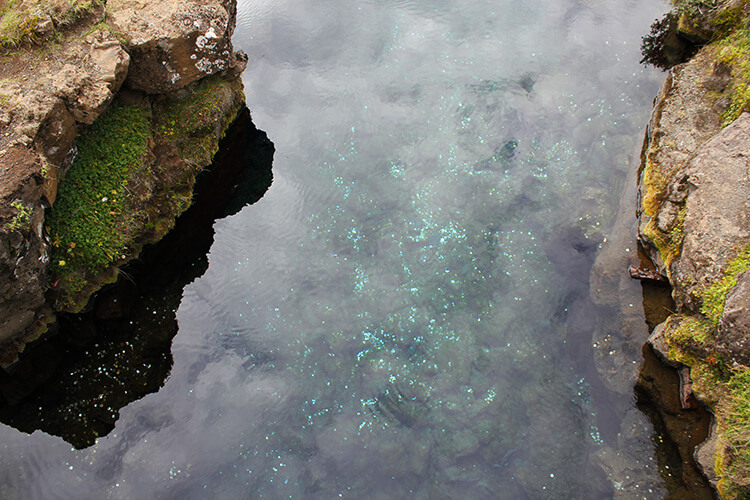 The myriad of coins in the water make it appear to sparkle under the Icelandic sun. Stroll around the loop from the visitor center, across the river, and on to the Pingvallakirkja Church. Pingvallakirkja is one of the first churches built in Iceland and it was consecrated by the Norwegian bishop Bjarnhardur. The wood and the bell that the people used to build the church came from Norway in 1015. When the original church collapsed in 1118, the people used the private church of Pingvallabaer Farm. 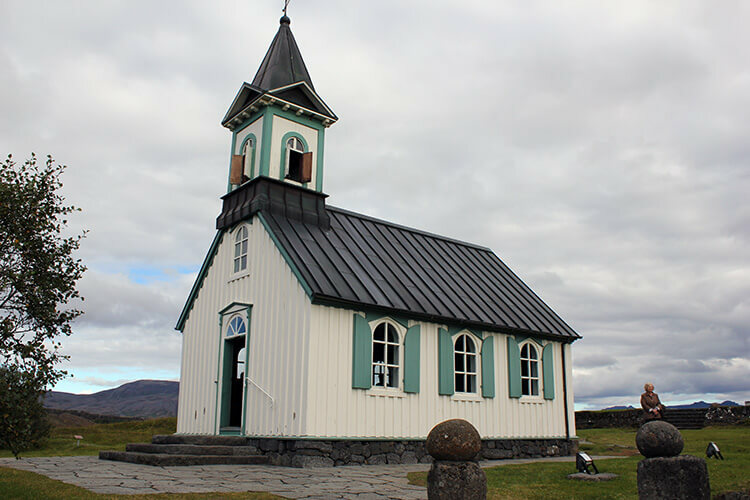 The church that you see today was built in 1859 and has three bells: one of 1118, one of 1698 and one of 1944 when the Republic of Iceland was born. Geysir is named for The Great Geysir, or Stori-Geysir, which has been dormant since 1916 when it suddenly ceased to spout. It came to life only once again in 1935, and as quickly went back to sleep. 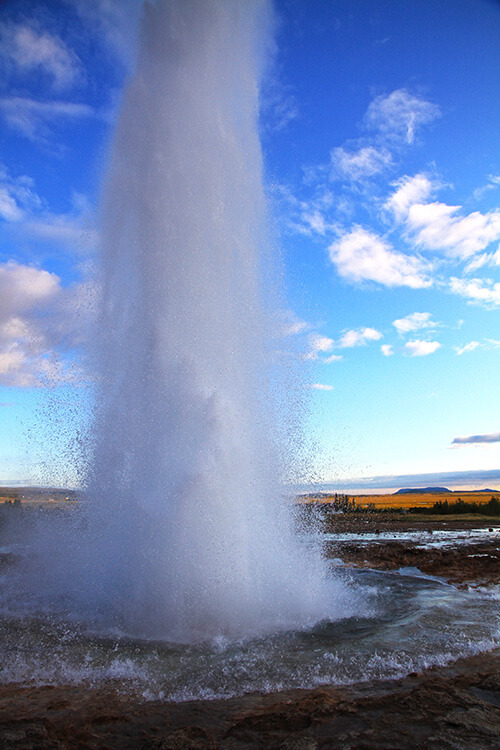 Now the attraction at Geysir is Strokkur (The Churn), another geyser 100 meters south of the Great Geysir, which erupts at regular intervals every 6 minutes or so and its white column of boiling water can reach as high as 20-30 meters. It is mesmerizing to watch as the water churns, the bubble finally appearing and just as quickly breaking as the geyser explosively erupts into the air. The whole area is a geothermal park sitting on top of a vast boiling cauldron. Belching sulfurous mud pots of unusual colors, hissing steam vents, hot and cold springs, warm streams, and primitive plants can all be found here. As you first approach the falls, the crevice is obscured from view, so that it appears that the mighty Hvítá river simply vanishes into the earth. As you continue along the misty path Gullfoss, meaning “Golden Falls”, suddenly comes into view. With a 105-foot double-cascade, Gullfoss plummets into the canyon below. On a sunlit day such as the day we visited, the mist clouds surrounding the hammering falls are filled with dozens of rainbows, providing an unparalleled spectacle of color and motion. Gullfoss nearly wasn’t the breathtaking sight it is today. In 1907, an Englishman wanted to buy the waterfall to harness the power to produce electricity. It was located on Tómas Tómasson’s sheep farm and refused to sell it at the time, but later leased it to the Englishman. Construction was planned to begin to build an electrical plant, but the farmer’s daughter used her life savings to hire a lawyer and have the lease voided. She even threatened to throw herself over into Gullfoss if the construction were to begin. Unfortunately, her attempts failed and the lease stood. But the Icelandic people were abuzz over her efforts and the construction never began. In 1940, Gullfoss was sold to the Icelandic government and in it was designated a nature reserve in 1979. We have Tómasson’s daughter, Sigriður Tómasdóttir, to thank for the beauty we enjoy in this spot today. Kerid is another stop along the Golden Circle. 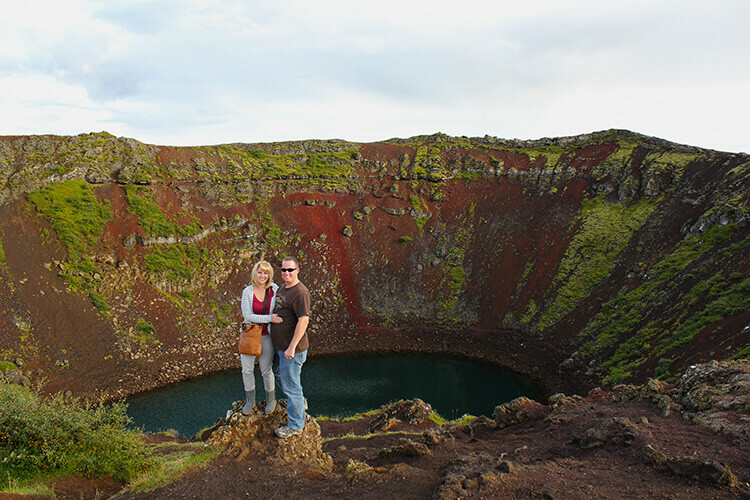 Kerið is a crater lake created from a cone volcano which erupted and emptied its magma reserve. Once the magma was depleted, the weight of the cone collapsed into the empty magma chamber. The caldera, like the other volcanic rock in the area, is composed of a red (rather than black) volcanic rock. The mossy green vegetation along the steep walls and the opaque and strikingly vivid aquamarine water of the lake below make for a breathtaking view as you teeter on the edge. Kerið Lake Crater is the only site on the Golden Circle with a nominal entry fee of 400 ISK (about $3 USD) to help preserve it. If you’re not up for doing a self-drive, you can book a Golden Circle Tour from Reykjavik. It is approximately 8 1/2 hours from pick-up to drop-off. 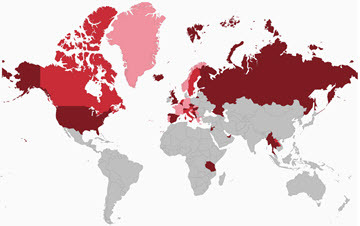 We recommend renting an affordable rental with SADCars and doing the self-drive using our map below. We recommend Túngata 32 or Hilton Reykjavik Nordica in Reykjavik or Hotel Berg or Northern Lights Inn in Keflavik. Snorkeling or diving Silfra at Þingvellir National Park was a highlight on our second trip to Iceland and we wished we hadn’t skipped it the first time. From the pictures I’d say Gulfoss is my favourite. I think you’d love the hike to Glymur, Leigh. It was quite the challenge and no hordes of tourists since it is so remote. Agreed, DJ. And Iceland waterfalls are a feast for the eyes and ears! So gorgeous and otherworldly it seems like sci fi, or theater. I was reading some years back that Canadian conductor Robert LePage based his then concept of Wagner’s Ring for the Met in NYC on such photos of Iceland. He reasoned that since the classic Norse myths which gave rise to the Ring were in fact Icelandic, perhaps the Icelandic landscape shaped and inspired our ancestors to devise such myths to explain the wonders. At the end of Das Rheingold, the gods walk across a rainbow bridge and ascend into Valhalla. That rainbow pic above seems to perfect set design for such a concept. Amazing photos and superb website. Very inspiring! But how do you travel so extensively with full time jobs? Do tell! Thank you, Jackson! We actually wrote a post on our secrets to how we travel so much with full time jobs. There’s really no big secret – it just takes planning and maximizing our holidays and vacation time. I love waterfalls! These are so gorgeous. Between the northern lights and the waterfalls, Iceland is so high on my list. I especially like the photo with the rainbow. You’d really like Iceland. You could go in September or March when it’s not really cold yet and still possibly see Northern Lights. These are amazing shots. I visited Iceland June last year and was blown away by the beauty of this country! Iceland is incredible. It was so different than what I imagined before my first visit, but in a good way! Iceland is a place I would return again and again for its beauty. These waterfalls look incredible! I can’t wait to visit Iceland (top of the bucket list). Hi Amy, Iceland is fantastic and we hope you get to visit soon. Thanks, Noel! I bet you do have some beautiful falls in Hawaii. I’d like to make it back there to explore more of the islands. How strange that I’ve never thought of waterfalls in Iceland, but of course there would be spectacular ones! I never thought of waterfalls in Iceland either before our first trip. I honestly didn’t know what to expect! I’d really never paid any attention to Iceland until the volcano reeked havoc on European air travel in 2010. But as soon as I arrived, I was just absolutely blown away by the spectacular scenery there. Wow those are some amazing waterfalls. Several of them look absolutely enormous as well! Yes, Iceland has some of the largest and most powerful waterfalls in Europe. Incredibly beautiful country. Oh my goodness, they’re all spectacular. 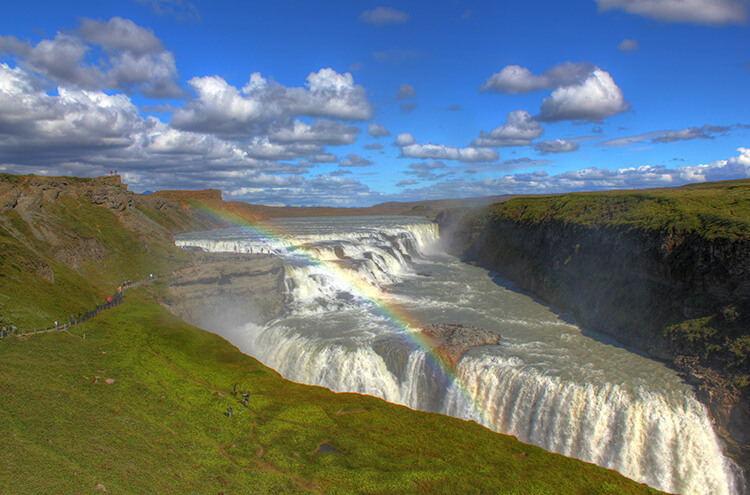 Love the photo of Gulfoss with the rainbow — so magical! Spectacular! Love the rainbow on Gullfoss. Yes, all truly beautiful! This is just one reason why Iceland is one of our very favorite countries! Hi, this is a great blog post. We were looking at doing a Golden Circle tour on our upcoming trip to Iceland and love the idea of a self-driven one. Would you recommend a 4×4 car for the journey or is the route mainly on main roads? Hi Jorge! If you are just sticking to the Golden Circle, any car is fine as the attractions on the Golden Circle route are all easily accessible on main paved roads. Hi there, we are looking to do the Ring Road from March 29 , flying home the following Sunday. I am inundated with websites, travels tips and information overload! Is this enough time? You’re literary looks great, did you book all pre book all hotels? Thanks! We did arrange all hotels in advance. Many of these country hotels have only a few rooms, so you want to have a reservation. Hi, yes I did! If we only had 6 or 7 nights,what would you recommend we skip or rush through!? Hi…my boyfriend and I are heading to Iceland in April. We are hoping to include the snorkel at Silfra on our tour of the Golden Circle. If we wanted to include all the sites you’ve listed in you blog, how long should we be budgeting? The tour company we’ve chosen leaves the city at 9-9:30…our plan is to rent our own car, meet them on site, and continue on clockwise around the Golden Circle. You’ll love Iceland! We also met for snorkeling at Þingvellir instead of having the pick-up and drop off. It takes around 1 hour to reach Þingvellir from Reykjavik and then about 2.5 hours for snorkeling. We snorkeled on another visit, so we were back in our apartment by lunchtime. You can definitely combine it with visiting the other Golden Circle sights. By April, the days are already much longer so you have a good amount of daylight hours and will easily be able to see everything. All these places look so different in winters! Did you visit Iceland in winters to see the lights? And then aftter driviing to Þingvellir National Park the next daay- do you then take Route 365 to 37 to Gulfoss? How long of a drive is that? Where would be a good place to spend the night? We will be going on to Vik for our 3rd night…..
You will love Iceland and self-drive is definitely the way to go. You get to see so much more when you’re on your own schedule. Yes, you can definitely stay in Hofsvik between Snaefellness Peninsula and Pingvellir instead of driving to Rekjavik. There is also the ION Adventure Hotel located right at Pingvellir if you wanted to wake-up and start your day right there. Hi Jennifer, really enjoying reading your blog, looking to go to iceland in middle of november and thinking of hiring a car for the three days. Probably just going to do blue lagoon, the golden circle and reykjavik town but just wondering would I get away with just renting a two wheel drive small car or would i have to get a 4 wheel drive because of it been mid november, also any suggestions for a good car rental to pick would be great. We don’t even recommend a small car in summertime. Highly advise you rent the 4WD as it was going to start snowing anytime now in Iceland. Not only that, the winds are what you truly need to worry about and those little cars blow right off the road. Looks Gorgeous! We are a family of 4 traveling to Iceland on May 13, 2018. We will be in Iceland 4 days and 3 nights. We are planning to stay the first night in Reykjavic and take a 2 hour tour and then start on a self drive golden circle tour. Instead of driving back to Reykjavic we thought we might drive the golden circle 1/2 way and spend the night. Where do you recommend we stay, town and lodging. Our kids are 12 and 13 and very good travelers. Thank you! We’d plan one day for the Golden Circle. You don’t need a tour and most Golden Circle attractions are free. Hello! Love your site. My husband and I will be in Iceland for 6-1/2 days in July 2019. Is it possible to do justice to Iceland with an itinerary along the lines of: Day 1: Blue Lagoon/Reykjavik; Day 2: Snaefellnes Penninsula; Day 3: Finish Snaefellnes and begin Golden Cirle; Day 4: Golden Circle and on to Southern Iceland; Day 5: Southern Iceland; Day 6: Southern Iceland and back to Reykjavik; Day 7: ready for departure. We’ll be renting a car and self-driving and your blog will be a tremendous help to us! Is this your first trip to Iceland? I think your itinerary sounds good and you’ll cover quite a bit in 6 days. Depending on what time you depart on the last day, you could explore a bit of the Reykjanes Peninsula. There are some really interesting things to see very close around the airport. https://luxeadventuretraveler.com/reykjanes-peninsula-iceland/ The daylight hours will be really long in July – nearly 24 hours – so you can pack quite a bit in to 7 days depending on how ambitious you are.